The top section of your resume is the most important real estate to get an employer’s attention. Objective statements used to be the top section however that’s generally more “old-school,” even for accountants -- we don’t see many new resumes with objective statements. Instead of an objective statement, provide a “Summary,” “Overview,” or “Highlights,” section at the top of your resume. This section should be targeted to the job post or specific position and include your key skills, talents, and achievements that you offer (or would like to achieve aka objective). The main goal is here leveraging that prime real estate by creating a headline with strong hook -- essentially picking keywords that will catch the employers’ attention and get your application shortlisted. Award-winning accounting graduate with highly analytical, mathematical, and detail oriented skill set. Technical skills include Oracle Financials Accounting Hub (FAH), Quickbooks, and Ceridian. Advanced training in Financial Reporting, Risk Management, Corporate Finance. Senior accountant with 8+ years of experience and comprehensive knowledge in AP, AR, General Accounting, Cost Accounting, and Corporate Finance. Proven track record boosting margins and driving profitability. Excels in financial analysis and strategic management. High-performing accountant with 3+ years in payroll, accounts payable, accounts receivable and 2+ years controlling expenditure and income. Exceptional financial auditing skills, including preparing accounts and tax returns. To make a high powered hook at the top of your resume, use one of the following objective statements -- or mix and match samples -- and be sure to personalize it from any pre-built accounting resume template. 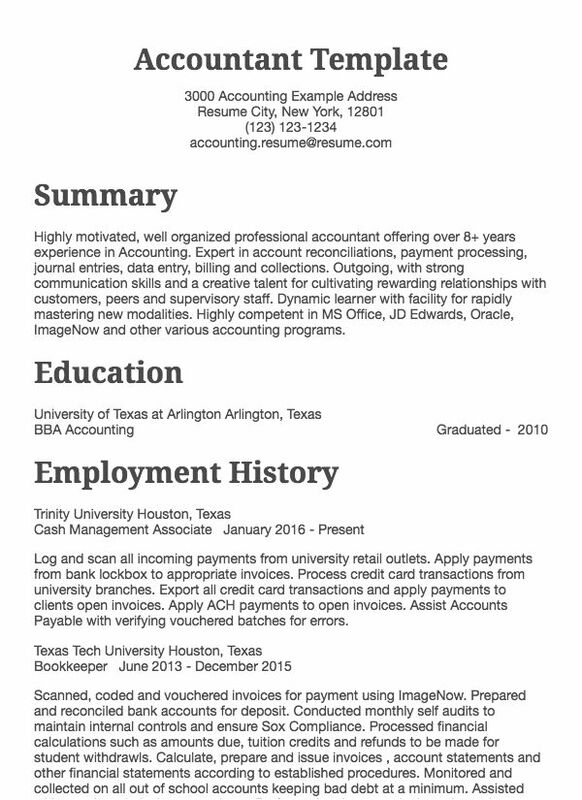 Award-winning accounting graduate seeking an accountant position with XYZ Company. Ideally suited for roles with highly analytical, mathematical, and detail oriented tasks. Seeking senior accountant role with XYZ Company, which will benefit from eight years of experience and comprehensive knowledge in ABC industry. High-performing accountant eager to work for XYZ Company. 3+ years in payroll, accounts payable, accounts receivable and 2+ years controlling expenditure and income. Exceptional financial auditing skills, including preparing accounts and tax returns. For an accounting resume, the best placement for your education is at the bottom of your resume with the exception of recent grads and students. Hiring managers care more about your job experience and skills than your education; but, if you have no work experience you should absolutely make your academic strengths and skills the key focus and center of your resume. In this respect, if you’re very experienced you shouldn't detail your GPA and course work.In inverse proportion to your experience, if you're still an accounting student or have very little or no experience as an accountant, you should go into greater and greater detail about your grades, course work, areas of specialization. Senior Project:Currently completing independent study on fraud examinations. If you have no experience as an accountant, a critical challenge is to ensure you have the right keywords on your resume so that applicant tracking systems won’t filter your resume out. HR systems filter out resumes based on keywords, like Google search, so an employer will search for keywords in their system like “accountant” + “accounts payable” + “auditing” and the system will rank and show resumes that match those keywords. The best way to ensure you get relevant keywords on your resume without any relevant work experience is adding them into your summary, education, and skills sections.